Description: The joy of the Lord is strength for all Christians. 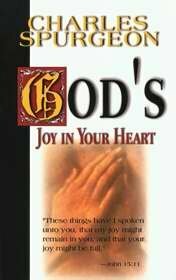 Charles Spurgeon shows how to receive joy that will remain despite the struggles, trials, and temptations of daily living. He reveals the secrets of how believers can obtain it, maintain it, and share it with others. Enjoy a refreshing break each day with these heartwarming devotional readings as you discover how you can ... + Build a strong faith + Be led by the Holy Spirit + Receive all that God has for you + Know the loving comfort of the Spirit + Find deliverance from heartaches and troubles + Take refuge in the safety of God's arms + Experience Gods, ever present help Through these encouraging words, you will come to know that 'YOU, too, can experience the peace that passes all understanding, an abiding joy that remains no matter what your circumstances dye, -and the confidence to minister God's love to others.